Be part of a professional group that performs for thousands of people, including at such prestigious venues as Playhouse Square, the White House, and national television. Low instructional fees are subsidized by grants and concert fees and includes instruction in singing, dancing, and stage presence, and the opportunity to be student conductors and choreographers. However, the best parts are the fun, the friendships, and the fabulous music that has a national reputation for excellence. The Singing Angels hold auditions and rehearse at the The Singing Angels Studios, 4560 State Road, Cleveland, OH (corner of State Road and Biddulph Avenue) A trained voice is not necessary; aspiring Angels need a pleasant voice, love of music and commitment to discipline. for online auditions, auditions at a concert, or if an alternate audition date is needed. For more information, please contact our Artistic Director, Charles Eversole at 216.432.5555 Ext. 1500, or email charles@singingangels.org. The Performing Chorus is filled primarily through the promotion of Reserve Chorus members, though a few outstanding auditioners will be accepted into the Performing Chorus as apprentices. Apprentices (1st year members) may be called to fewer concerts during the Christmas season. The Reserve Chorus includes new members who join the Singing Angels for training and are then eligible for consideration to join the Performing Chorus after an evaluation of their musical skills and progress. The Reserve Chorus will perform in concerts during the Christmas season as well as in the Spring. The Littlest Angels Training Chorus is the Singing Angels experience for second and third graders! The Littlest Angels Training Chorus does not require an audition. We teach beginning singing and performing skills, rhythm and music theory, and our program features special concert opportunities! Boys and girls from 4th grade through age 16 should be prepared to sing a song of their choice, without accompaniment, at the Performing Chorus and Reserve Chorus auditions. 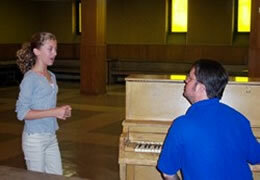 No appointment is necessary on audition days and previous musical training is not required. We are looking for children who can sing in tune with a pleasant sound. Great attitudes and vibrant smiles are a plus! Enrollment into the Littlest Angels Training Chorus does not require an audition. Information may be downloaded here, application here, or call Carol Thompson 216.432.5555 Ext. 1700. Rehearsals for the Performing Chorus are held each Saturday from 12:30PM to 4:00PM at The Singing Angels Studios during the regular school year. Weekday and Sunday rehearsals are added throughout the semester. Apprentices may be asked to attend early or come to special rehearsals. Rehearsals for the Reserve Chorus are held each Saturday during the regular school year from 11:30AM to 2:00PM at The Singing Angels Studios. Rehearsals for the Littlest Angels Training Chorus are held each Saturday during the regular school year from 9:15AM to 10:15AM at The Singing Angels Studios. There are 9 total sessions, plus 2–3 performance opportunities. Concerts for all choruses are normally scheduled so as not to conflict with regular school hours. A monthly schedule informs Angels' families of concerts and rehearsals and other important information. Parents or guardians are responsible for their child's transportation to and from rehearsals and concerts. Carpooling is encouraged. There are instructional fees and uniform costs for the Performing Chorus and Reserve Chorus. Payments are due shortly after rehearsal start. Current cost information can be found here. There are fundraising opportunities each semester. Instructional fee aid is available for the Performing Chorus and Reserve Chorus (Instructional Fee Aid Application Form). Please contact Holly Harris at 216.432.5555 ex.1800 for further information. There are instructional fees for enrollment into the Littlest Angels Training Chorus, however instructional fee aid is not available. In order to maintain the high standards for which the Singing Angels have become known in the community, all chorus members are expected to abide by the established regulations. These rules and regulations are defined in the Regulations Handbook. We are also looking for pianists, bass players, and drummers to accompany the choruses. Please contact our Artistic Director, Charles Eversole at 216.432.5555 Ext. 1500, or email charles@singingangels.org to schedule an audition time.